Native Lorettville, Jean-Guy Barbeau came to Chicoutimi in 1951. Graduated from the School of Fine Arts of Quebec, he taught art for 25 years at the Chicoutimi School Board and assumed during accrued the Université du Québec à Chicoutimi. It is a pioneer in the teaching of arts in Saguenay with Pierrette Gaudreault, founder of the Art Institute in Jonquière, while pursuing his own quest in his studio in the rue Melancon. His work, too little known to the Quebec public, radiated from Quebec to Europe. He was the first Canadian painter to exhibit in solo in Poland in 1976, at the Contemporary Art Gallery Katowice Bwa and Hungary. In 2008, Jean-Guy Barbeau became the first recipient of the Award for Recognition of Excellence, the highest distinction awarded by the Council of Saguenay arts to highlight the involvement of a person in the fields of arts and Culture. Jean-Guy Barbeau received the honor for his work, its importance in Québec and abroad, for its relation to the history of culture and to be a typical example of an artist who has chosen a career in Saguenay. Emulates the great masters of painting, sensitive to the audacity of the other, the journey of this painter includes many trends, from tachisme to abstract, from Fauvism to Cubism. Explorations where he returned with a style all his own, a style that survives and echoes of future works. Barbeau’s art is timeless. The eye takes pleasure in diving into geometric compositions of his games, surfing the transparencies carefully brushed in layers, does not preclude a careful sensitivity to the major concerns of his time. Cantor woman certainly, but not only that. Some of his paintings evoke the military conflicts, human suffering; others tell our past. He is the author of an imposing wall of over 278 square meters realized for the Press House was inaugurated in 1980, which summarizes the highlights of the history of the region. 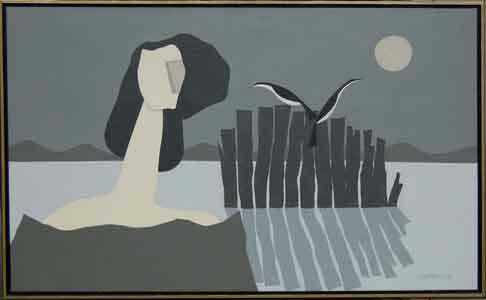 A major retrospective of his work was presented in April 2007 at the Chicoutimi Pulp. He could hear and see the love and admiration of those who were his students, his companions, his friends, all dazzled by a teacher who is not imposed on others if not his own fervor to achieve the absolute in shape and color. A work that moves us, like the man he was, well beyond the time! This entry was posted in Biographies, Jean-Guy Barbeau and tagged artist, Barbeau, personnages, saguenay artist by lacorniche. Bookmark the permalink.